In the 1960s, BBC Television broadcast a series of animated cartoons based on Gerard Hoffnung's Little Books. I had never seen these since so was delighted to find this DVD containing all of them; even more so when I discovered that they were in digitally restored, vivid colour because 1960's TV was monochrome in the UK. 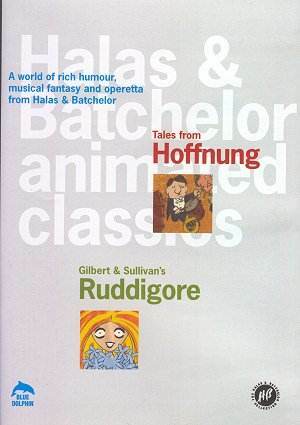 The Hoffnung animations last about 50 minutes Also on the DVD is an animation of Gilbert and Sullivan's Ruddigore [49minutes]. The DVD is supported by interviews with the creators, trailors and picture galleries. Total running time 104 minutes No regional restrictions. PAL encoded. An orchestra like no other. Musical and visual gags abound before reaching a momentous climax. The conductor leaves the concert hall unperturbed. The dedicated orchestra plays on through a series of incredible events, oblivious to their increasingly surreal surroundings. A naive father makes an embarrassing attempt to explain the facts of life. The narration is by Peter Sellers with his own brand of humour. The music professor has his work cut out as his pupil's enthusiasm for Liszt, Wagner and Mendelssohn's music gets them into trouble with their instruments. A salesman sells a vacuum cleaner with perfect pitch. It new owner performs at the Albert Hall accompanied by similar instruments. When it comes to cleaning, a saxophone does the job. A line of British Barinets are cursed to commit a crime every day ... or die! This story of love and revenge with its ghosts and magic is an ideal vehicle for animation.